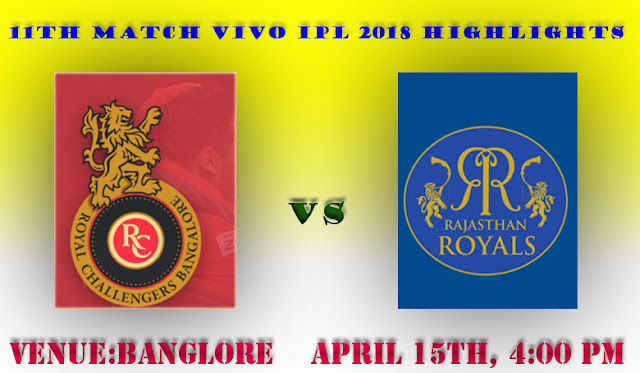 Sanju Samson One man show took Rajesthan Win Over Royal Challengers Bangaluru.Sanju Samson's breathtaking strokeplay formed the cornerstone of Rajasthan Royals' 19-run win over Royal Challengers Bangalore in a high-scoring IPL encounter on Sunday. Batting first Rajesthan royals Put a High Score on the board for bangaluru who has got strong batting Line UP. The Young Keeper Batsmen from Kerala Sanju Samson Samashes 10 sixes and one four in the innings, Scored 92 Runs in 45 balls. Chasing the big target, Royals loosed dangerous maccullam out in the first over. Came into first down skipper virat kohli batted with good strokes from the beginning, Completed his first fisty in 30 balls. None of the batsment other Than Kohli not contributed to chase the score. Bangaluru Short by 19 runs.